I just bought new grey couches and I was looking for something to compliment them and my living room. What can I say? I Love It! Looks amazing and the quality is great! Safavieh Mid-Century Modern Vida Lacquer White / Black End Table - 23.6" x 23.6" x 15.8"
Modern luxury at its finest, this contemporary coffee table brings a touch of design decadence to any interior. Crafted with a dramatic white lacquer finish, the elegant geometry of its iron base adds visual interest for a sophisticated minimalist style. This is a great coffee table for the price. I love the lacquered top and the overall midcentury look. Please note the dimensions and measure so you know what you're ordering - as others have noted, this table is very low. The low height is appropriate to the midcentury style, and I like it because it's a kid-friendly height for my little ones who often sit on the floor. I wanted white, but didn't want something that looked like bad faux marble. This is just a pure white lacquered finish, it's not trying to be anything it's not. Fast delivery and the box was light enough I could move it inside with ease. Assembly was super quick and easy (instructions say 10 min but it was less). Only two base parts and five bolts. Cleanup of the box and styrofoam took a considerable amount of time, effort and vacuuming, but that's to be expected for an item like this. 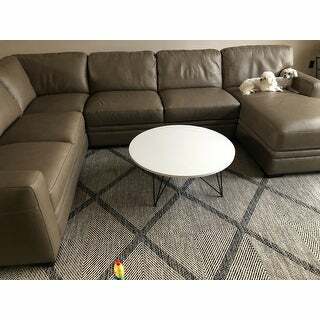 Using this table in my family room with our L-shaped sectional, and the circle shape makes easy flow around the table. Highly recommend! Clean, classy, and very nice! Exceeded my expectations. Looks expensive! Great coffee table! This is a great small table for a small space. I had a couple of low sitting chairs in my family room and this table worked perfectly ! It is really cute and goes with any style. Would definitely recommend this one. Beautiful sleek high quality table. It looks like the picture! It's a bit low but that's what I wanted. East to assemble, love the mid century style look, will make your home look expensive and modern instantly! I absolutely love this table! I needed something to fit in with my low sitting modern sectional and this is perfect! FYI... it sits really low so if you’re trying to fit this with a high sitting sofa, I don’t think it will work. And it’s a solid white. I thought it had a little more pearl in it according to the pic. But I like it just the same. Super solid. Seems to have a stone/ceramic top. 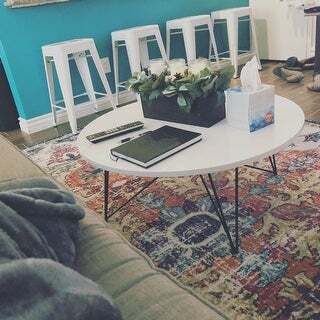 It does stand pretty low, so best for a low modern couch if used as coffee table..
Beautiful coffee table. Only complaint that it was a little shorter than I expected despite measurements before ordering. This is a great purchase. The table is glossy and beautiful. Easy to assemble. I will be buying more Safavieh products. Feels and looks a lot more expensive than it actually was. shorter than you would think but lovely! It feels elegant and expensive. IT so far has taken a beating from my kiddos and still looks great, going to say durable so far!! Very low to the ground and extremely cheap looking. I have searched for months for the perfect table for the living room and finally decided on this one. It’s a perfect fit! It is a bit shorter than I had expected but we still love it. great quality- small and perfect. Top chips easily. Great size and height. "When will this be back in stock?" This item will not be back in stock for a minimum of six months. "Are there end tables that go with this coffee table?" Unfortunately, we do not currently carry any matching end tables. The coffee table is 14 inches high x 33.5 inches wide x 33.5 inches deep. Safavieh Mid-Century Woodruff Oval Coffee Table - 51.2" x 27.6" x 17.7"
Safavieh Mid-Century Ryne Lacquer Stacking End Table - 19.3" x 19.3" x 21.3"
Safavieh Wynton Oak Finish/ Black Coffee Table - 44" x 31.5" x 15.6"